Feral cats in the garage? Wild cats on your property? Do you wake up at night because of fighting feral cats? Are feral cats attacking your pets or are feral cats defecating in your yard or children’s play area? You have the right to have us trap feral cats and remove feral cats off of your property. We get rid of feral cats for you, safely, legally and humanely. 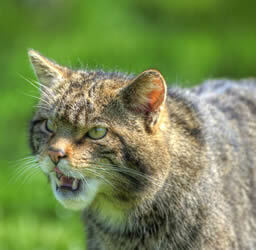 We focus on feral cat removal or wild cats. These felines would be best described as cats that have lost, or never received proper socialization. In essence, they have become, or were born, wild. Feral cats often vocalize loudly at night while fighting and mating. Doorways, vehicles and other objects and areas are often sprayed by cats to mark their territory, creating a very unpleasant smell. As feral cats are uncared for, they often harbor diseases and ectoparasites. Feral cats are also known to act aggressively towards humans and pets, making feral cat removal necessary. Our clients with bird feeders often discover that their backyards become hunting grounds for feral cats. Feral cats kill countless numbers of songbirds and native wildlife species each year. What areas do we provide our Feral Cat removal service? Trapper J, a North Louisiana Nuisance Wildlife Animal Removal specialist is the most professional and humane nuisance wildlife control service available in Monroe, West Monroe, Ruston, Bastrop, Alexandria, and Pineville in the North and Central Louisiana area. Primarily serving the North and Central Louisiana Parishes of Allen, Beauregard, Bienville, Catahoula, Concordia, Caldwell, Claiborne, East Carroll, Franklin, Grant, Jackson, La Salle, Lincoln, Madison, Morehouse, Natchitoches, Ouachita, Rapides, Richland, Sabine, Tensas, Union, Vernon, West Carroll, Winn and surrounding communities. We also service the North and Central louisiana cities and towns of Alexandria, Arcadia, Bastrop, Colfax, Columbia, Oakdale, Farmerville, Harrisonburg, Homer, Jena, Jonesboro, Kinder, Lake Providence, De Ridder, Oak Grove, Oberlin, Marksville, Monroe, Natchitoches, Rayville, Ruston, Saint Joseph, Tallulah, Vidalia, West Monroe, Winnfield, Winnsboro. I'm hearing scurrying noises in my attic at first light, and at dusk. At night everything is quiet? Trapper J Says...You are dealing with a grey squirrel infestation, an inspection of the exterior roof and roof line will show you where the access hole is and where to set the traps. I'm hearing something walking around the attic, it sounds very heavy and all the activity is at night?Trapper J Says...You are dealing with a raccoon, an inspection of the roof and roof line will show you the access hole and where to set the traps. I have something that has dug a hole under my deck, I fill it in but every morning it opens back up? Trapper J Says...Your dealing with a skunk. If it was a groundhog the activity would only occur during daylight hours. I saw a skunk going under my shed but I'm not smelling skunk odor, shouldn't I be smelling a skunk if there living on my property? Trapper J Says...Skunks do not go around spraying there musk all the time, they have a limited supply at any one time and only spray when they feel threatened. Skunks can go a year without releasing there musk. An animal chewed through the soffit of my house and I think it is living in my attic. What do I do? Trapper J Says...The best way to handle a situation like this is to call us to catch the animals for you. Once the animals have been removed, he can repair the damage to prevent other animals from gaining access. I found a baby wild animal on my property, what do I do?Trapper J Says...It is best to leave it alone. Usually the mother will come and pick it back up, try not to disturb wildlife. Trapper J has the training, equipment and experience to handle your nuisance wildlife situations. He can resolve your current wildlife problem and then "animal-proof" your home or place of business to prevent future infestations. We also conduct damage cleanouts (including dead animals and droppings), repairs and deodorizing with environmentally safe products. We strive for the most humane and environmentally effective techniques for handling nuisance wildlife problems. The use of modern innovated methods will provide sound wildlife management services to ensure the protection of our customer's investments and most importantly their health. We will repair damages, install custom and standard chimney caps, seal homes completely to prevent wildlife from entering, remove bird or bat droppings from an attic, install burial fencing, and remove dead animals, and pretty much anything related to a wildlife problem. A professional wildlife control operator is a person with demonstrated expertise in the art and science of applying the principles of wildlife damage management to the sound resolution of wildlife conflict with humans. NWCOA, a nonprofit, professional trade association devoted to professional development of the Wildlife Damage Management Industry through the individual development of well educated, experienced, and dedicated wildlife control operators. Frustrated with Unwanted Animals Damaging Your Home? Choose Professional, Experienced, Licensed Animal Removal Specialist, Trapper J. - Jerry D Robbins, renowned animal control specialist, affordably captures animals that are a nuisance to you, your family and your home, property or office. We will meet or beat our competitors pricing! We pride ourselves on being thorough, professional and affordable!